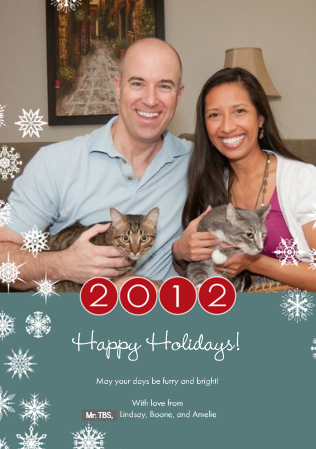 I love getting holiday cards in the mail, especially those with cute baby/family photos and newsletter updates. We almost didn't send out a Christmas card this year. No particular reason. It just never made it to the top of the to-do list. But I couldn't pass up an eleventh-hour 70% off promo at CardStore.com, so I spent 30 minutes typing addresses and placing an order of 65 cards at 11:00 p.m. on December 13. And would you believe it? Our cards were delivered within a week, even internationally. Sometimes, it pays to procrastinate. May your days be furry and bright. You can see last year's Christmas (post)card HERE. We wish you the merriest of holidays! adorbs!!! love this card, and love the discounted rate you got it at even more!! I ran down our driveway last night during our car unloading to grab the mail, and I did a little midnight jig when I saw your faces! Merry Christmas, TBS family!! Merry Christmas Lindsay! Wishing you and your family a day filled with joy and cheer! Again, stoked to call you a friend. When I opened this baby I squealed with joy...! I hope you and your family enjoyed the Christmas holiday :) Enjoy the rest of your time before school starts back up!